Garnish with fresh mint or basil leaves and fresh strawberries for extra color. To prepare streusel, preheat oven to 325°F. Combine all streusel ingredients in a food processor and pulse until crumbly. (Or stir ingredients together in a bowl using a fork or your hands.) Bake at 325°F for 12 to 15 minutes or until golden brown. Let cool then coarsely crumble. 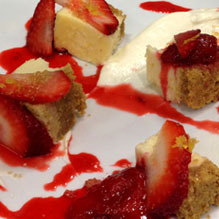 To prepare cheesecake, preheat oven to 300°F and place rack in the center of the oven. Butter and flour a 9- inch springform baking pan and tap out excess flour. Place the Requeson cheese in a large mixing bowl and stir until it's as smooth as possible with a rubber scraper. Add sugar and flour and mix well. Stir in eggs 1 at a time, then stir in vanilla, lemon zest, and salt. Pour batter into the prepared pan and bake for 1 1/4 to 1 1/2 hours or until a sharp knife inserted into the center comes out clean and the top is a light golden brown. Cool on a wire rack. (It will sink slightly as it cools.) Cover and chill until ready to serve. Beat crema, vanilla and sugar in the bowl of an electric mixer fitted with a whisk attachment until light and fluffy. Cover and refrigerate until ready to serve. Top each cheesecake slice with a spoonful of crema, then streusel. Garnish with halved strawberries and mint or basil, if desired.